On November 10th, Tufts ALLIES, a program of the Institute for Global Leadership, kicked off its fifth annual Civil Military Relations Conference (CMRC) on “Security, Society, and the New Climate Regime.” This conference centered the importance of climate change for national security policy professionals, in both military and civilian fields. Tufts ALLIES was joined by partner chapters from the US Military Academy at West Point, the US Naval Academy, and the US Coast Guard Academy, as well as students interested in the science and policy of climate change from across the Boston area. The conference began with a panel on the impact of climate change on international security. Panelist Dr. Rachel Cleetus of the Union of Concerned Scientists began by stating that “Climate change is already here… and these impacts will only worsen,” but made clear that “we still have choices that will shape the world for our children and our grandchildren.” She argued that the effects of rising sea levels on coastal areas threaten enormous damage, and the US has not addressed the potential consequences with the seriousness required, particularly with regard to key American military installations, such as the air base destroyed by Hurricane Michael in Florida’s panhandle. Dr. Casey Brown, a professor of civil engineering and a former U.S. Air Force officer, discussed how his early military career led him to realize how important and vulnerable local water supplies can be, and the enormous web of problems climate change is on track to create regarding fresh and potable water. The specter of water-driven conflicts looms large with increasing pressure on water resources globally, even though, to day, this has traditionally been handled “with lawyers, not guns,” Dr. Brown continued. 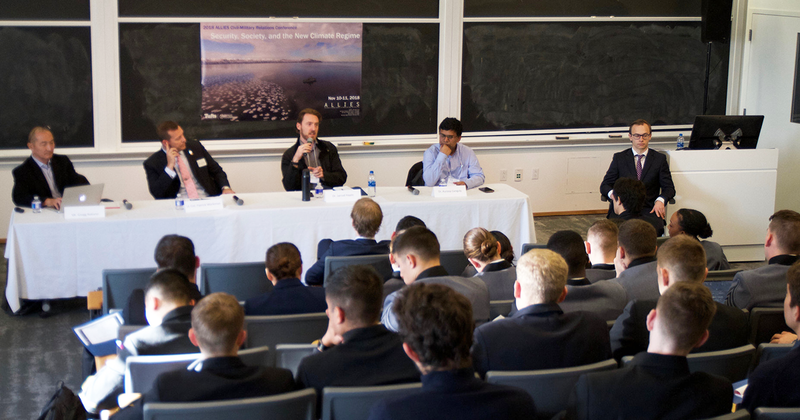 The conference’s second panel focused on the national security implications of climate change, discussing the roles of the government and the military-industrial complex in furthering climate-based degradation. Disagreement arose between panelists Dr. Jarrod Hayes, Professor at the Massachusetts Institute for Technology, and Colonel Patrick Workman, of the U.S. Army, as to whether the military could or should provide a positive example of climate mitigation. Dr. Auroop Ganguly of Boston University offered an alternative viewpoint of how the military and private sector could innovate in the field of climate security. Lastly, Gregg Nakano, a Fletcher School alumnus, PhD candidate at the University of Hawaii, and advisor of the ALLIES Joint Research Project in the Pacific, proposed options for students today on how the U.S. can adapt to climate-based security threats. The conference’s keynote speaker was Mark Nevitt, a professor of national security law at the University of Pennsylvania Law School and a former naval officer. Nevitt discussed the US’ responsibility to take a leadership role in efforts to deal with climate change, and in particular the need to use its tremendous resources to help smaller and poorer countries adjust to the changing environment. Nevitt argued addressing climate change is not only an environmental but a national security priority for the United States, and that taking the initiative on the issue would be a tremendous positive step and well worth the cost. The following day, the cadets and students participated in the CMRC crisis simulation. Taking control of fictional countries designed by ALLIES members, the participants navigated an escalating scenario of geopolitical and ecological threats in an extremely fast-paced environment. They saw everything from trade deals to assassination attempts to cataclysmic hurricanes. In the process, participants engaged in intensive negotiation, strategic thinking, and were forced to grapple extensively with the intersection of climate change and international conflict.